I have a love/hate relationship with hose pipes. I know I’m lucky to be able to have access to a tap on my allotment and to be able to use a hose for watering. The prospect of having to do all the watering with just a can fills me with dread. It can take 3 hours to give the whole plot a thorough soaking. Often, to try to speed up the process I’ll have the hose watering a patch whilst I grab cans filled from a neighbouring plot’s tap. Last week I counted 30 watering can journeys. 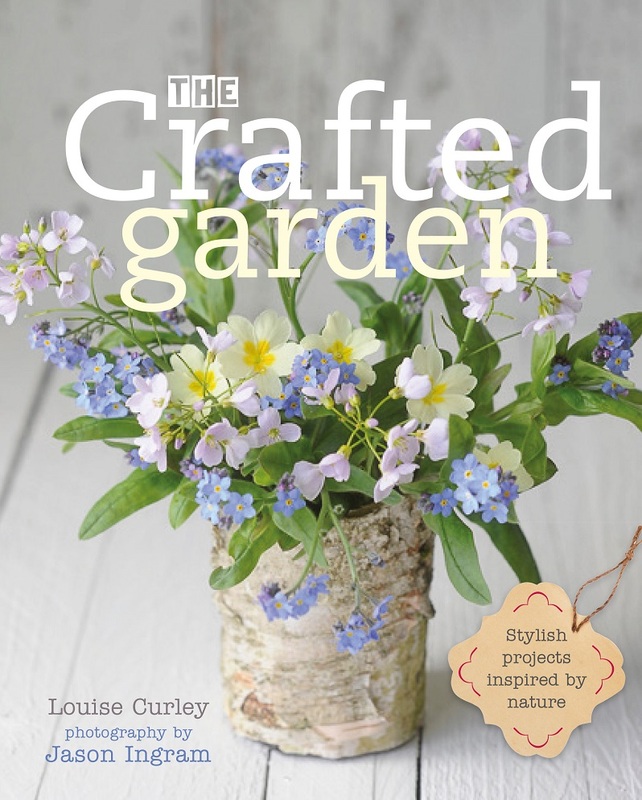 So, yes, hose pipes are fabulous, a boon to the gardener, a fantastic labour-saving tool…. that is until they develop a mind of their own. You’re standing there watering your fruit/veg/flowers, drifting off into a world of your own, thinking about the long list of things you need to do – the shopping list, the sink that needs unblocking or whatever else that fills your mind at times like this. Then you’re jolted from your dreams by the hose pipe coughing and spluttering. There’s a kink somewhere. So you head off to unkink the kink, the water flows freely once again but just as you return to the nozzle to start watering again it becomes a trickle once again – another kink. Aaaarrrggghhh! 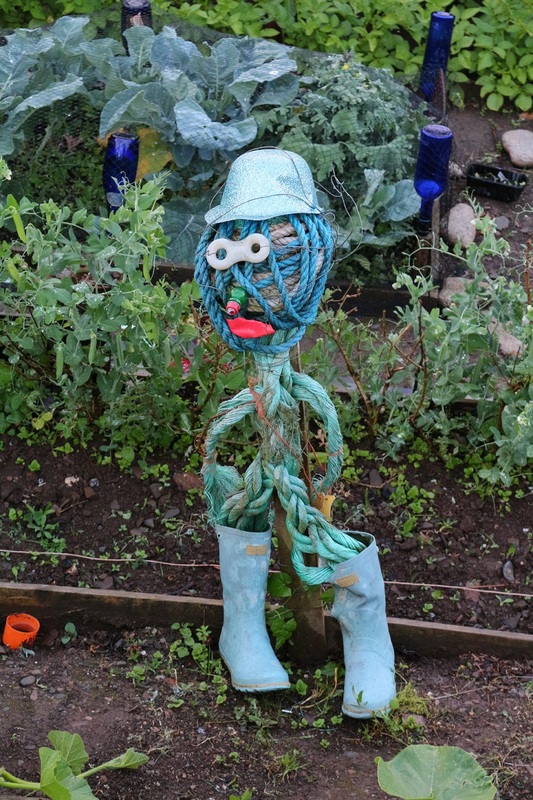 I’m sure there are passers-by who wonder what is going on as this increasing irritable allotment holder wanders up and down her plot muttering and possibly swearing at a hose pipe. The hose at the allotment has developed a leak too. I could gaffer tape it but that would require me remembering to take some with me on my next visit and as I often find myself at the allotment without even secateurs or twine that seems to be asking too much. Instead a fine shower of water sprays my leg as I walk past the raspberries and it has been like this for 2 years now – I know, I know …. Then there’s my garden hose on a reel. It kinks too and gets trapped on the reel and requires regular unravelling. I’ll admit in previous years I have not watered my garden and pots simply because I couldn’t face having to devote time to wrestling with this hose pipe. A few months ago I was asked to review some products by the company Hozelock. I’ll admit that I didn’t pay a huge amount of attention to the email as at the time I was just about managing to juggle all the plant growing with work and the seemingly endless barrage of emails requesting one thing or another. Then a parcel arrived. I have spent the last few months using the mini hose pipe ‘Pico Reel’, so thought it was about time to give it a bit of a review. The problem with my old garden hose, which has now been relegated to behind the garden shed, was its size and weight. It was quite bulky, heavy and cumbersome. Because of this it spent a winter outside as there was no more room in my shed to store it and frost damaged the nozzle which meant it would spray out along the length of the nozzle as soon as I turned on the tap. Hozelock’s new mini hose the ‘Pico Reel’ is much smaller and lighter. It fits neatly against the wall next to the tap and I can carry the whole reel with me as I water which means the hose doesn’t get caught around pots like the old one used to. 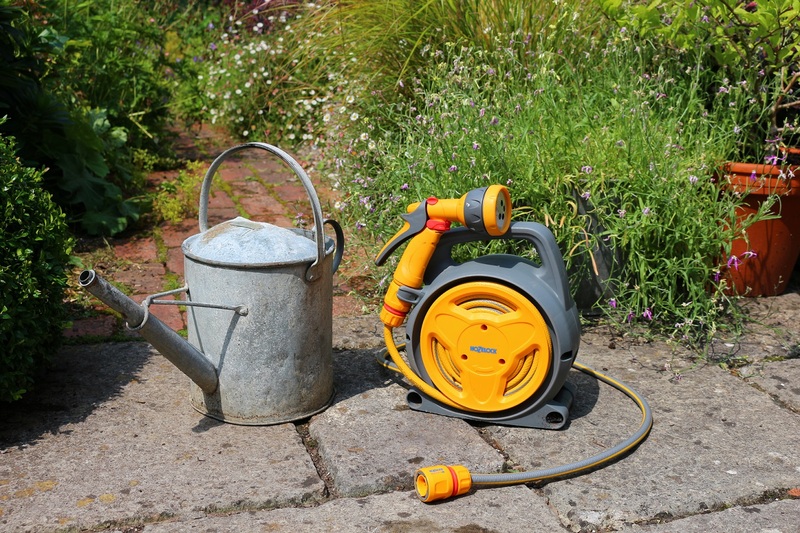 The downside of a smaller, lighter hose is that it doesn’t reach quite as far as the other and it’s just too short to reach the bottom of my garden – the main hose stretches to 8 metres with an additional 2 metres provided by the section of the hose with the nozzle attached. The bulk of my watering though is the pots scattered around the patio and those in the greenhouse, all of which it reaches easily. It has a handy and easy to use lock which means you can leave the nozzle in a pot slowly watering and go off and do something else, and best of all it hasn’t kinked. It’s funny how the ease of use of a product can really make such a difference to a task. Rather than sitting on the sofa choosing to ignore the plants needing water because I can’t face fighting with a hosepipe, this summer my plants have all received the care they deserve. If you have a small garden, courtyard or balcony this could be the hose pipe for you. The weedkiller applicator, the Wonderweeder, on the other hand was never going to go down well with an organic gardener and this is really where I should have paid more attention to the email. 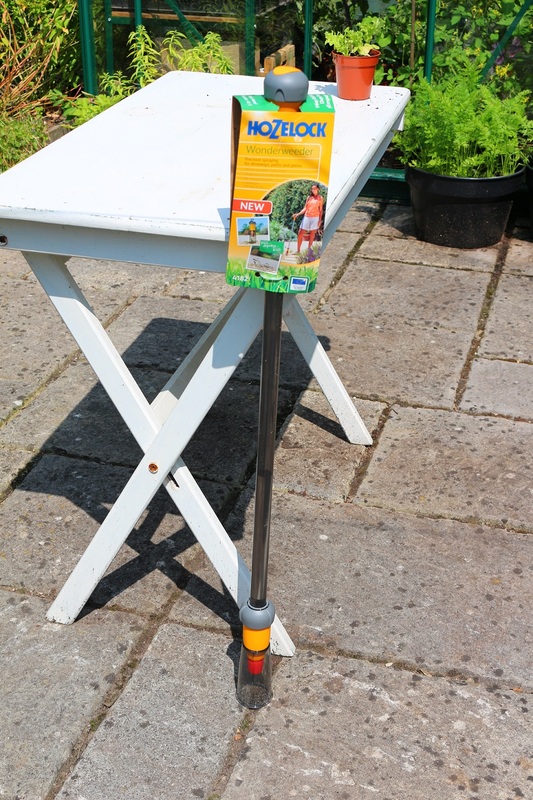 It works by pouring weedkiller into the long tube via the handle, then, whilst holding the bottom of the pole over a weed you push down the top of the handle where it delivers a shot of the weedkiller. The bottom nozzle is protected by an outer cover of plastic so that the spray is confined to a small area. Personally I would rather dig out a weed than kill it with a chemical but I tried the product using just water to see how easy it was to use. There’s a small cap inside the handle which allows for measuring of the liquid although it wasn’t very clear to me how I was meant to distinguish between the different amounts. It also required quite a few pushes initially before anything actually happened. If you do use weedkillers the advantages of this product are that with its long handle there’s no need to bend down and it targets the weed and doesn’t spray a wider area. I’ve seen too many trigger happy weedkiller users in the past with little regard for what they are actually spraying so this is a useful feature. My concern though is it does dribble between sprays so you would need to watch what you’re doing when moving between different weeds, otherwise you might inadvertently splash other plants or your feet. 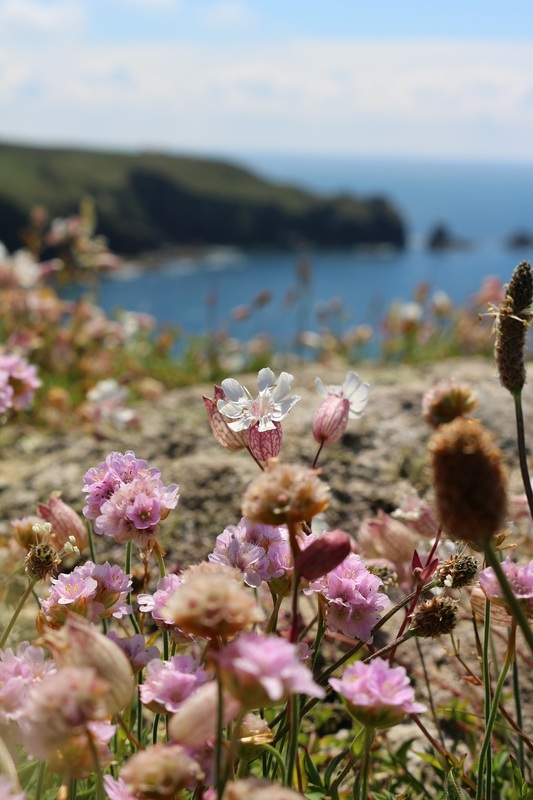 Cornwall’s mild climate means a whole host of plants from around the world can grow happily there. Most visitors are drawn to the National Trust gardens, Eden and Heligan but if you look beyond these there are other places where you can get a plant fix too. 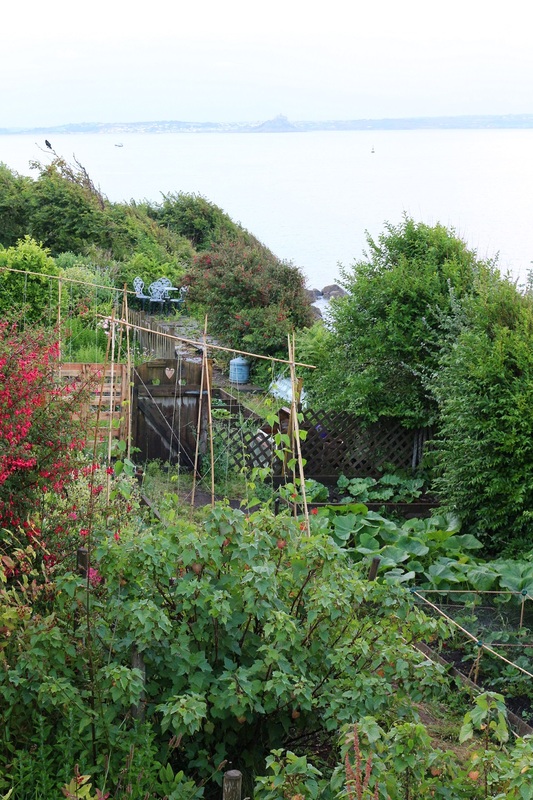 Driving along the coast road from Newlyn to Mousehole I spotted the tops of bamboo canes clearly arranged to provide support for runner beans and a glimpse of some allotments. Later that evening we came back to take a closer look at the plots perched on the cliff with views out towards St Michael’s Mount. It must be incredible to grow here, with the sound of the sea below, although I’m sure the salt-laden winds pose problems and I’d be a little worried about coastal erosion. Further up the coast at Praa Sands this winter’s storms had taken their toll, worryingly so for the homeowners whose gardens were creeping ever closer to the edge. Even so I loved these plots and their quirky scarecrows created from all manner of salvaged finds. It’s unusual to find houses which come with a garden in the tiny fishing villages which dot the Cornish coast. That might explain the extraordinary waiting time to take for an allotment in this area, which according to the Penzance Town Council website ranges between 5 and 9 years. And, rather than devote more land to allotments the council have decided to divide any plots which become available into two in the hope this will tackle the waiting list. When a patch of land does come with a house it’s clearly much appreciated. This row of gardens, in Mousehole, were squeezed into a strip of land above the sea and separated from their houses by a quiet road. As gardens go they are tiny and exposed to whatever the weather throws at them, but it was heart-warming to see how they were clearly precious to their owners. On our final day we decided to slowly make our way home rather than heading straight back. Our first stop was Kestle Barton. We’d picked up a leaflet for the place the previous day in St Ives and thought it might be worth a visit. Billed as a rural arts centre it was the garden designed by James Alexander Sinclair which persuaded us to divert there. This isn’t the sort of place which you are just passing by. A combination of directions on the leaflet and Google Maps directed us down ever narrower country lanes until we eventually found ourselves at the end of the road and our destination. When Karen Townshend, ex-wife of The Who’s Pete Townshend, came across these old farm buildings dating back to the 19th century they had been untouched by modern agriculture and were crumbling into a state of ruin. Now they have been stunningly and sympathetically restored to provide an exhibition space and self-catering accommodation. 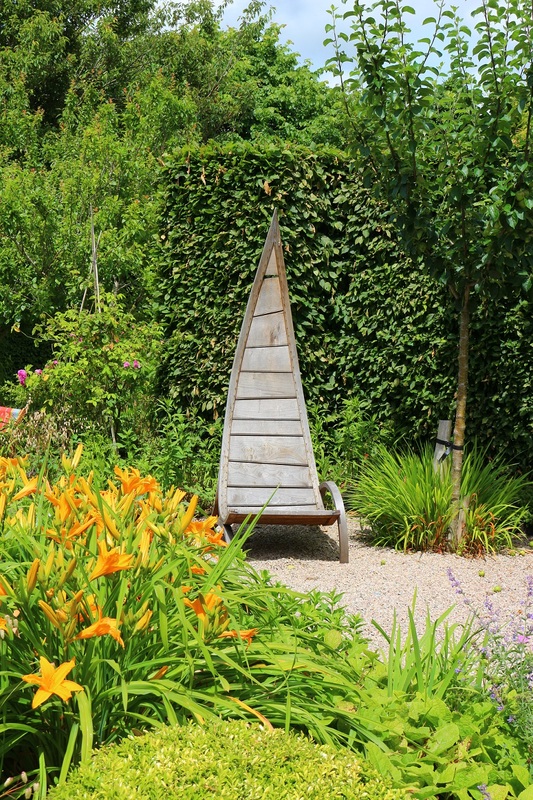 From the barn you walk out into a south-facing garden with bold drifts of herbaceous flowers and grasses. The scent from the mass planting of the lavender was divine and the sight of the vast meadow teeming with bees and butterflies was a delight. I’ve since discovered that the surrounding farm land is managed with the environment in mind. Tree planting projects, a commercial walnut nuttery, an orchard of Cornish apple, cherry and plum varieties and organic principles all form part of a plan to show how farming can adapt to climate change. Small field boundaries are being restored and native hedgerows planted. I love the ethos and if the wildlife in the meadow was anything to go by the environmental principles are working. As an arts centre though I’m not so sure. The space here was perhaps too small – just one barn – and the handful of images weren’t very well presented. Maybe on another day with another exhibition it might have been different. As for the garden, well I think it could be the real attraction here. James Alexander Sinclair’s design and plants work so well in the setting and I loved what was there. 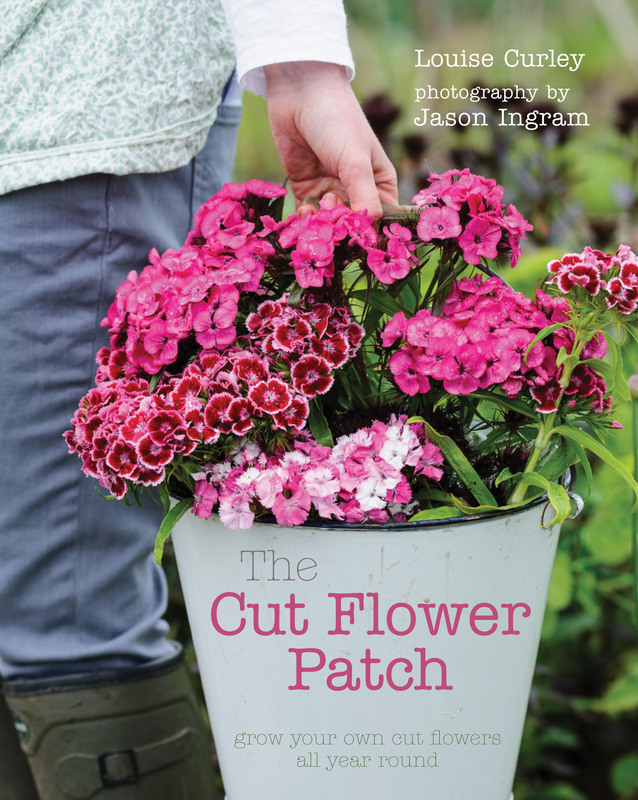 It was what wasn’t there that was the problem – I didn’t understand why there were so many patches of bare soil. It looked like some plants had died or that the garden hadn’t yet filled out. It seems that the garden was planted in 2010 so maybe it just needs a bit longer to become established. Kestle Barton could be such a fantastic place, I really hope it can just find that extra oomph to take it there. 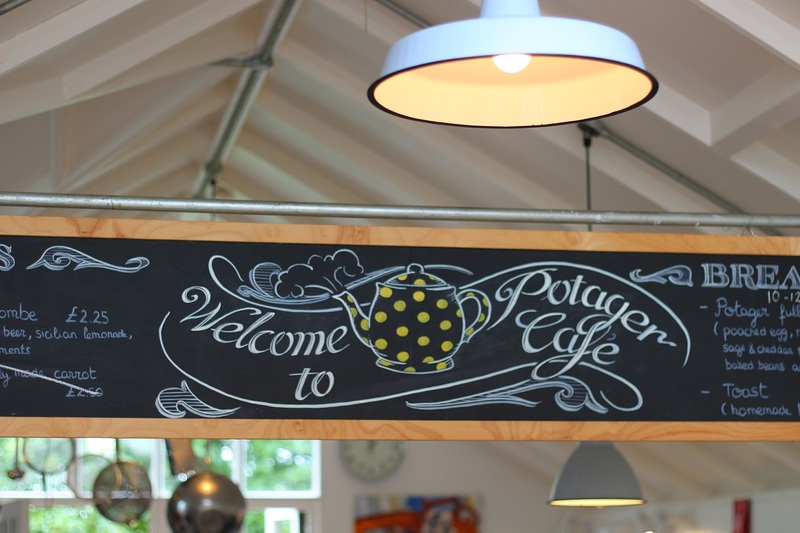 Our next stop was The Potager Garden about 20 minutes from Falmouth, tucked away in amongst the creeks of the Helford River. I’d spotted this place a few years ago in a weekend newspaper but we had never got round to visiting. It was Wellyman who remembered that we weren’t too far away and it would be perfect for a spot of lunch. An abandoned nursery, glasshouses and grounds have been lovingly restored to provide an idyllic setting in which to eat, drink and relax. There were hammocks in shady corners, table tennis, and packs of cards and dominoes dotted about. You know those sorts of places where you feel like they can’t wait to get rid of you, well this wasn’t one of them – they actually want you to linger here. And what a place to while away a few hours. The plants which were once nursery stock have become established plants. Many were growing through their pots into the ground when the site was rediscovered after ten years of neglect. 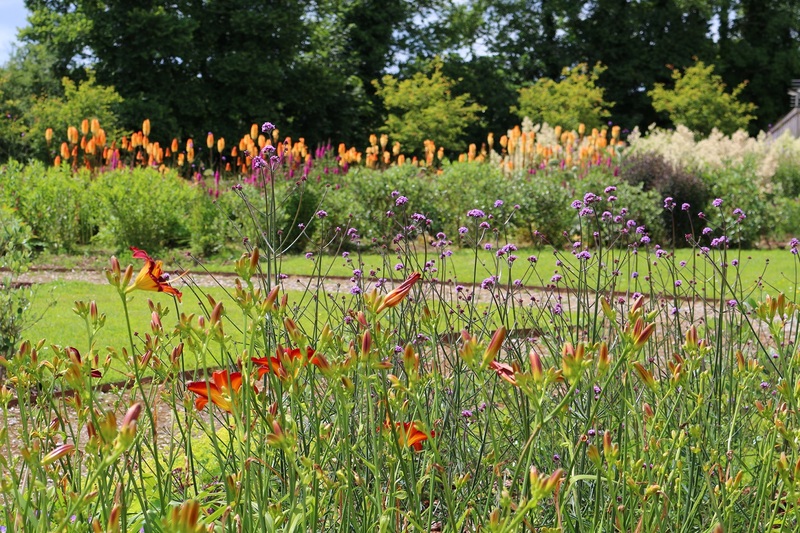 The idea has been to create gardens which are both attractive and productive and they’ve succeeded. I knew the food would be good but it was a real surprise that the gardens were so beautiful too. 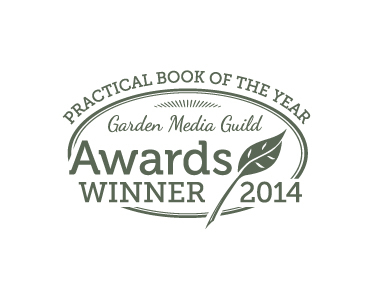 I’d love to hear about your own off the beaten track garden discoveries. 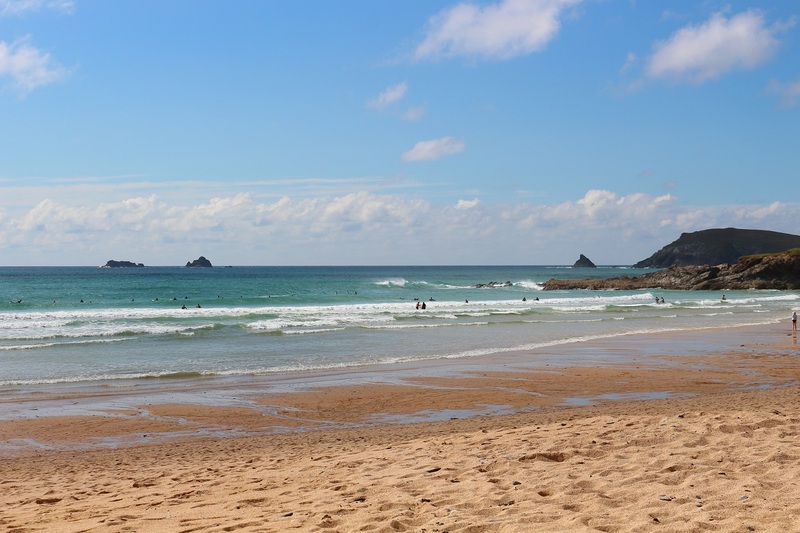 It wasn’t perhaps the best time for a bit of a break but the other week we popped down to Cornwall for a few days. Ideally I wouldn’t leave my plot, garden, greenhouse and ever-growing number of pots in late June, but it was Wellyman’s birthday and we both needed to see the sea. The rigmarole of making sure everything survives whilst I’m away does sometimes make me wonder whether it’s worth it. I’m reluctant to ask neighbours and friends to look after the plants because I know that can be a bit of a pressure for some, especially if they don’t have ‘green fingers’ or it’s very dry and they have enough of their own plants to cosset. I did once leave lots of emerging seedlings in a friend’s greenhouse but slugs got to some of the plants. I felt bad for my friend who clearly had been worried about the whole thing. She’d rushed out to get organic slug pellets and I think had dreaded my return and having to break the news. Now that I need plants for photo shoots I’d rather leave it up to me, then at least I’ve only got myself to blame if they shrivel and die. It does of course mean trying to make sure everything will get enough water, and it’s surprising how quickly pots and plants on a sunny windowsill can dry out, even if you’re only away for 4 days. The prolonged dry spell we’d had prompted us to hunt out the irrigation system gathering dust in a cupboard, which we bought 8 years ago but never got around to using. It’s a straightforward hose with sprinkler attachments and timer on the tap. The fiddly bit is getting the water to soak into the compost and not to spray everything else – greenhouse windows, paving, me. We spent a few days adjusting the settings and initially massively over-estimated how long we’d need to leave the timer on. Bearing in mind the water only trickles out we thought 10 minutes would be about right. It turns out this would have drowned them and 2 minutes was more than sufficient. Pots were gathered together in a shady spot and given a good soaking, windowsill seed trays were given a base of sodden kitchen roll, and the plot and garden were treated to a mammoth watering session. Ironically by the time we set off it looked like we needn’t have bothered with all the watering. It seemed we’d time our get away with the glorious weather coming to an end as we headed into mist and gloom hanging over Devon and I shivered in my shorts and tshirt. Wellyman, always one to put a positive spin on life, said at least I wouldn’t have to worry about the plants drying out……. Breaking up the journey we called in to see the lovely Becca and Maz at The Garden Gate Flower Company near Fowey. We met through Twitter and it was lovely to meet them in the flesh. I’m very jealous of their flower farm perched on a hill with the sea only minutes away surrounded by beautiful flowers, incredibly photogenic outbuildings and their polytunnel. 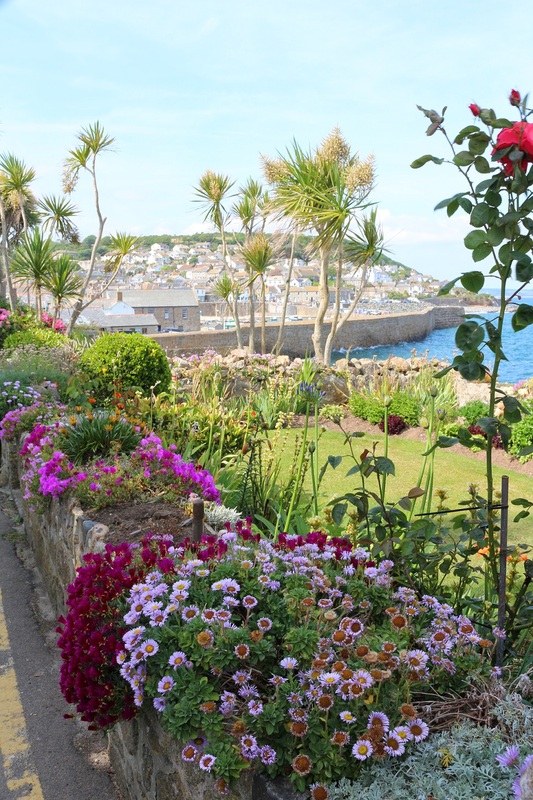 After a few hours of wonderful flowery-chat we left them to tend their roses and continued on to the fantastically named Mousehole, pronounced by locals as ‘Mauzal’. 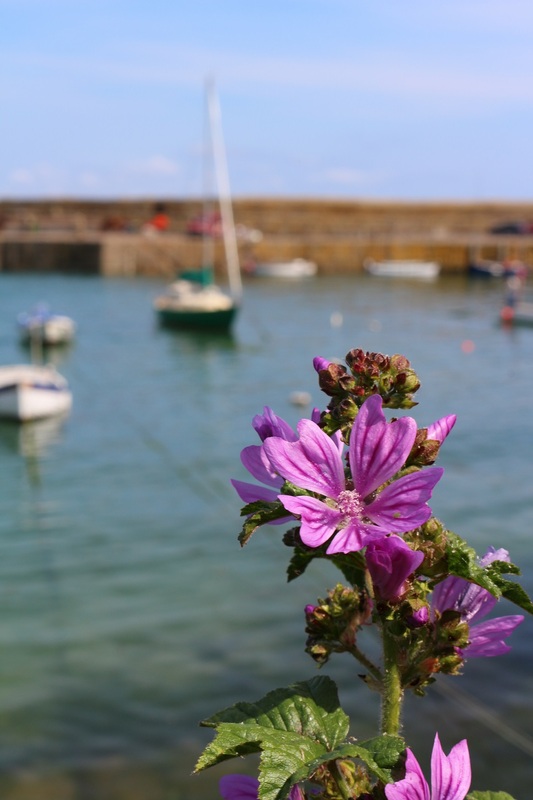 It’s a classic Cornish fishing village with whitewashed cottages, tiny narrow lanes and a pretty harbour. And what’s more the sun came out. With all the technology at their finger tips the weather forecasters could have only got our four days in Cornwall more wrong if they had suggested it would snow. As it turned out the predicted four days of rain turned into glorious sunshine from start to finish. A detour to Constantine Bay, near Padstow, on the way home. 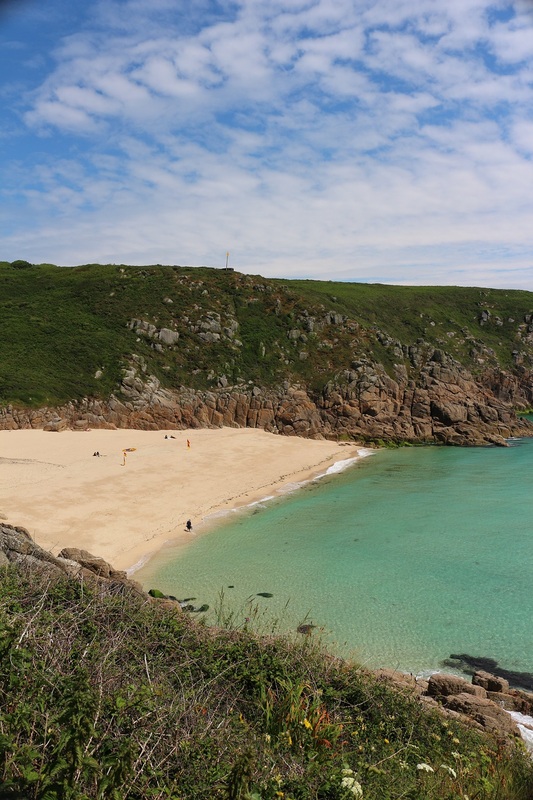 We got to marvel at glistening turquoise waters, white sandy beaches, watched gannets plunge into the Atlantic and were delighted by the seal which popped up at Sennen Cove just as the sun was setting. The water was so clear at St Ives we watched as a seal swam torpedo-like under water to join a group of surfers. We chased it the length of the beach watching it come up with crabs in its mouth. It would disappear for a few minutes and we would scour the surface of the water waiting to see its head bob up again. I’ve seen seals in the past but generally they have been from boat trips to specific seal colonies. Great as these are there’s something much more special about these chance encounters we had. I have never been to Land’s End, mainland Britain’s most westerly point. We have been close enough before but I’ve always been put off by the visitor attraction which has sprung up on this spot. I’d rather celebrate the dramatic beauty of this coastline by enjoying the peace and tranquility of the place rather than spend it at a petting zoo or being treated to tales of Arthurian legend. Something made me want to see the actual Land’s End though and I’m so glad we did because whether you want to pay to see a 4D movie or stare out to sea for free there’s the space for both types of visitor to co-exist. We took the coastal path out of Sennen and walked a well trodden path along the cliffs for a few miles. The view was spectacular with the Isles of Scilly just visible on the horizon and the Longships lighthouse a mile out to sea. Sea thrift was fading but wild carrot was putting on an impressive show and there were choughs soaring above us. A red beaked and legged member of the crow family this is a rare bird with, it’s estimated, only 250-350 breeding pairs in the UK . Colonies exist in North Wales and Scotland but it’s with Cornwall that this bird is synonymous, featuring as it does on the county’s coat of arms along with a tin miner and a fisherman. But for nearly 30 years, from the 1970s to the start of the new millennium, choughs were absent from Cornwall – the population whittled down over the centuries by trophy hunters and changes to their habitat until their were none. Then a pair, believed to be from Brittany, set up home in Cornwall in 2001 and successfully bred and choughs returned to Cornwall. And, of course there were plants but I think I’ll save those for the next post.